The Lake District is one of the most picturesque areas of England and makes a great place to get away from it all and relax. You’ll feel like you’ve stepped into a postcard when you arrive, with beautiful mountain vistas, old-fashioned villages, and glistening lakes. Set yourself up in a quaint Lake District holiday cottage and spend a week relaxing in nature. 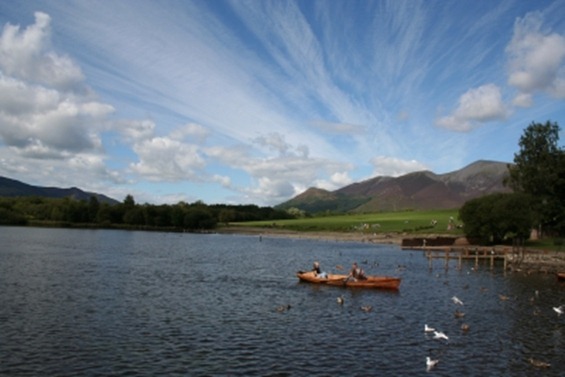 There is no shortage of activities to keep you entertained while visiting the Lake District. Most activities here are based in the outdoors, so make sure you bring along your walking boots so you don’t miss out on some of the best walks in the UK. Visit the Muncaster estate, home of the Pennington family for at least 800 years and explore the castle, gardens, and World Owl Centre. Visit at night to try and meet some of the castles resident ghosts! Take a trip on one of the historic steam driven boats which have plied the lake of Ullswater for 150 years. Sit back, relax, and take in some of the most beautiful scenery in the country. There is no shortage of activities taking place at the Brockhole Visitors Centre on the banks of Lake Windermere. Pack a picnic and spend the day exploring Brockhole’s gardens, exhibitions, and water sports. Hope on the oldest, longest, and most picturesque steam railway in the Lake District. You’ll feel like you are one of the only people in the world while chugging along these old-fashioned tracks. William Wordsworth and his romantic poet compatriots are partly to thank for the English love affair with the Lake District. Visit the childhood home of the poet and experience late 18th-century Lake District life first hand. Head up to the top of the Honister Pass in Borrowdale and learn about the slate mining process that has changed little in the last 300 years. Fully guided tours of the mine are available and the centre is open 7 days a week. Those with artistic leanings will enjoy a visit to this beautifully preserved Arts and Crafts home. Today the home also serves as an art gallery, displaying contemporary and historical Arts and Crafts works. If you’re looking for adventure, look no further than the highest mountain in England. The climb is straightforward but not recommended without proper preparations, but the views from the top are the best in the area. If you’re looking for crazy nightlife then the Lake District isn’t the place to come. This doesn’t mean however, that there isn’t a wealth of things to do and places to go in the evening. Visit this year-round professional theatre to take in a production in the 400-seat Main House, a newly-extended 100-seat Studio. This 40 year-old arts centre offers the very best in cinema, theatre, dance, comedy, and entertainment and houses a cafe, bar, and restaurant. Put on your fanciest dress and spend an afternoon betting on the horses at the Cartmel Racecourse. Check their website for race day information. The Lake District is home to some of the best food producers in the country. From sticky sweet desserts, to locally reared meat, you will never go hungry in the Lakes. This eclectic little restaurant is locally renowned as the place to come to relax and unwind. In 2010 the restaurant was listed as one of the greatest little restaurants in Europe by the Sunday Times. This food shop and canteen is the best place to come for a relaxed and delicious lunch. With plenty of healthy salads and vegetarian options you can afford to have a luxurious dessert as well. Here’s one for the beer lovers! Set on the banks of the River Kent in Staveley, the Hawkshead Brewery and Beer Hall serve unpretentious food in lovely surroundings. A trip to the Lakes wouldn’t be complete without some of Sarah Nelson’s delicious ginger bread. Grab a packet and a cup of tea and head to the shores of the lake to enjoy. The Lake District is a great destination any time of the year. In summer you will find it buzzing with activity and visitors from around the world, while in the winter there are few places more serene. Just wrap up warm before you head out for a winter walk and then spend your evenings warm in front of an open fire at a local pub, like The Strickland Arms in Penrith.